We understand that choosing the right colours for your exterior or interior can be quite difficult, after all your home is your pride and joy. We always encourage our clients to make use of sample pots to test potential colours on the surface to be painted. 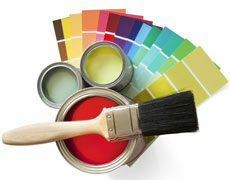 – Make sure to paint a decent square of colour and apply two coats to view the true colour. – This practice will help you save a lot of time and money and give you a clear idea of your desired colour.